Ok we come a long way in this course and we have now set the stage for perhaps the most important Point in this whole video series - How PEMF creates the EMF that charges your cells! For many years I have been telling people that PEMF acts like a whole body battery recharger which charges and energizes your 37 trillion cells. In this module and the next we are seeing why and how through electromagnetic induction and magnetic resonance energy transfer!! 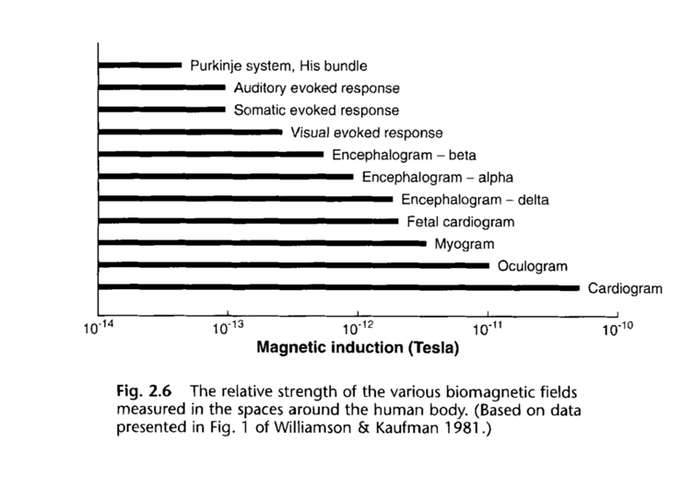 Magnetobiology is a subset of bioelectromagnetics. Bioelectromagnetism and biomagnetism are the study of the production of electromagnetic and magnetic fields by biological organisms. When biological material produces an external magnetic field, this is called Biomagnetism. 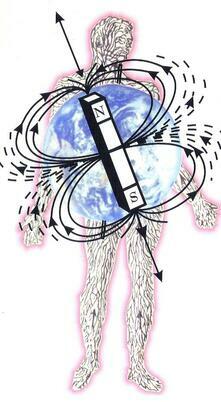 Any living thing, like a human body gives a magnetic field OUT. 1. Natural Ion Currents in the body, from muscles and nerves (heart, brain, etc.). The same currents from the heart that give you an electrocardiogram, give you a magnetic field outside the chest called the magnetocardiogram. The same ion currents in the brain that give you the EEG give you a magnetic field outside the brain called the magnetoencephologram. 2. Contaminating magnetic particles in the body (in longs, stomach ,etc.). You can breathe in magnetic dust into your chest, junk and that will give you a magnetic field. Ok, we have seem HOW PEMF devices can induce an EMF, NOW we need to see HOW that EMF moves charges and currents in the body, tissues and cells to produce the MANY benefits PEMF provides. But in a nutshell PEMF moves charges to produce energy. PEMF devices through Faraday's law of induction generate an EMF that Moves electrons, protons and charges in the cells which increases ATP production and charges the cellular voltage. EMF in PEMF devices is Changing Magnetic Field Induces Naturally Bodily Currents. Current is not added to the body, it is induced. EMF in Electrostim products is a battery or AC plug that drives CURRENT directly into the body. That is PEMF devices induce charge in tissues using the body's OWN natural charged ions, proteins and molecules (especially Na, K, Cl, Mg, Ca . Because of this , unlike electrotherapy, your body cannot be overcharged by PEMF, while electrostimulation CAN actually burn tissue because it uses externally applied electrical energy. PEMF is indeed the next-generation in Electrotherapy technology, which uses pure pulsating magnetic fields instead of electrical currents. Our tissues and cells are much better adapted to respond to PEMF therapy rather than electric currents and electric fields. I want to conclude this video with a comparison between PEMF devices and other electrotherapy and Electrical stimulation products. They can all create similar signals, but the way the energy is transmitted is different and this makes ALL the difference! Here are examples of Electrical Stimulation Products..
Scenars like RITM, Dove and Tennant Biomodulator. Zappers - Hulda Clark , etc. And remember from the last video that By PEMF device I mean a pemf product that uses one or more perfectly circular and tightly wound copper or conducting loops to yield a pure magnetic field through the center of the coil. Here is the main difference in a nutshell... PEMF therapy induces currents in tissues, whereas Electrical Stimulation products like those mentioned, applies currents to the tissues. 1000% more effective than electromedicine, because it uses non-invasive induction technology. It reaches deep tissues but does not need to use invasive metal electrodes. What sorts of fields have effect on tissues. PEMF uses electromagnetic induction to convey electrical signals to cells deep within tissues by induction, without penetrating skin with electrodes. Because PEMF therapy uses pure pulsating magnetic fields as the delivery mechanism for the stimulation (as opposed to electrical current), it can induce and generate micro-currents deeper in the body using the body's OWN natural charges. Because PEMF uses the Body's natural charged ions, electrons, protons, etc, the natural electrical currents induced will be much safer and more effective. Tissues cannot be overstimulated by low intensity PEMF like electrical stimulation (or high intensity PEMF which creates WAY TOO MUCH induction to the point of making the muscles twitch ... more on this in a future module). Problems with Electrical Stimulation Products. As we mentioned electrostimulation is the direct application of current to the body, and it uses electrodes and conducting gels or liquids. The MAJOR downside of electrostimulation is the limit of its penetration into the body due to impedance (effective resistance) and dielectrics (shields electric field). Electrical stimulation can often be painful and very uncomfortable. It also requires the skin or tissue to be exposed to the electrical current. PEMFs have none of these disadvantages. ​Application of PEMFs can be done without exposing the skin and directly exposing the body to electric currents. There is no risk of burning with PEMFs. Most of the time there is no sensation from PEMFs. In addition, PEMFs will go through clothing and through all the tissues of the body without being absorbed, used up or blocked by the body. As a result, PEMFs produce a much deeper penetration and benefit within the body. Electrical stimulation often masks pain but does not heal the underlying cause. 3) Loss of signal fidelity - a square wave won't remain a squarewave deeper in the body. Because no impedances or dielectrics, PEMF signals will remain TRUE like a good reception on a radio station. So in conclusion, Electrotherapy products add current TO THE BODY. And because of this there are issues of microelectrocution, lack of penetration , impedances (effective resistance) of varying tissues and degradation of the fidelity of the signal. ​Because PEMF signals can penetrate all the way through the body, PEMF is able to induce energy flows and currents on all level and scales from the whole organism right down to the mitochondria and ATP. Lorenz Force law describes this F = qV x B. And PEMF devices induce charge in tissues using the body's OWN natural charged ions, proteins and molecules (especially Na, K, Cl, Mg, Ca). 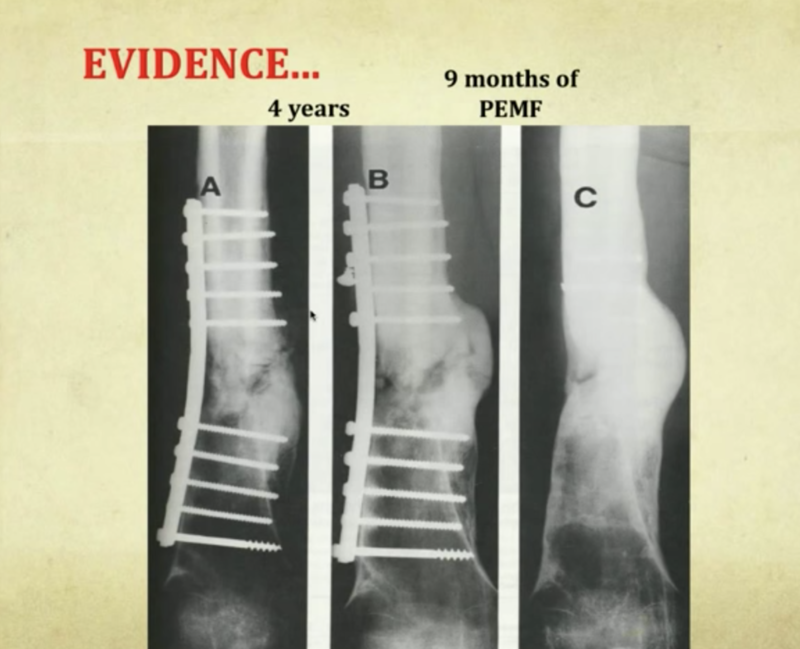 Because of this , unlike electrotherapy, your body cannot be overcharged by PEMF. Energy Flows Giving us health and Life. Proteins are dipolar and can vibrate, resonate and radiate in phase with other proteins. While there are a lot of charged particles in the human body, organs, tissues and cells, let's focus on how PEMF by Faraday's Induction charges the cellular Voltage which I feel is perhaps the most important role PEMF therapy can provide for your health. According to Nobel Prize Laureate, Dr. Otto Warburg, cells maintain a voltage across their membrane, which is analogous to the voltage of a battery (called transmembrane potential or TMP- trans "across & potential in physics is "voltage") . He found that healthy cells have a measureable voltage from 70- 100 millivolts, with the heart cells having the highest (upwards to 90-100 millivolts). Along with ATP, the TMP is one of the primary ways the body stores energy... and ENERGY = HEALTH! Dr. Warburg found that due to the constant stress of modern life along with a toxic environment and the aging process, cellular voltage drops (along with many other factors when have been addressing in this course). People with chronic illnesses and chronic fatigue unilaterally had a diminished cellular voltage (30-50 millivolts). Cancer patients displayed the lowest voltage at less than 15-20 millivolts. Ever wonder why there is no heart cancer? The reason is because the heart cells have the highest voltage of any cells in the body. Think about that! Jerry Tenant MD wrote a book called “Healing is Voltage” In his book he explains that injured / damaged cells require 2x more energy to repair. So you see, health is literally an energy game at the “CELL”-ULAR level. There truly are no exceptions to this rule; if your cells have energy you are healthy, if not, you get sick. As the graph in figure 21 shows, if we can keep our cellular voltage charged in the healthy range, we can radically extend our lifespan. This is why PEMF therapy devices are one of the most powerful and effective anti-aging tools available today! So how does the body maintain this precious cellular voltage? This cellular voltage is mainly created and maintained by pumping 3 Na+ ions from the inside to the outside of the cell, and 2K+ ions are moved from the outside to the inside of the cell, giving the cell a net charge of 70 millivolts. 70 millivolts might not sound like a lot but it equates to an electrical potential gradients of some 10^7 V/m across the 10 nanometer thick membrane. Bound enzymes are also involved in the directional transport of ions and metabolites from one side to the other. For example, Na+ is transported out of, and K+ into the cell by the Na+K+ Atp-ase. The conventional account is ATP is used to "pump" N+ out of the cell in exchange for K+, which is why Na+ concentration remains low inside the cell while K+ concentration is high. Usually The energy for this "uphill" movement of charge comes from ATP hydrolysis (the splitting of ATP into ADP and inorganic phosphate). For every molecule of ATP that's broke down. Remember, it takes energy to separate charges. UP TO 50% of cellular ATP is used up by the membrane pumps to maintain this transmembrane potential. The signals that travel along neurons take the form of modifications to the potential difference between the inside and outside of the axon of the (the long slender part) of the neuron. A certain enzyme pumps Na+ out of the axon, and K+ ions into it. But it pumps MORE of the former, so the exterior has a positive charge relative to the interior; its potential is about 70 mV higher. This is the resting potential. The nerve signal consists of a wave depolarization, where Na+ ions rush into the axon and then K+ ions rush out. This modification to the potential is called the action potential. At a given location it takes a few milliseconds for the signal to pass, and the potential then returns to its original value. The speed of the depolarization pulse along the neuron is roughly 100 m/s. Although the nerve signal is in some sense an electrical signal, it isn't an actual current. There is no net flow of charge along the neuron; there is only the traverse motion of the Na+ and K+ ions. The propagation of the signal depends on the opening and closing of various enzyme channels, so its speed is not remotely close to the speed of an electrical signal in a metal wire, which is on the order of the speed of light. PEMF therapy helps to enhance this process thereby improving nerve signal flow. Muscle cells also have a dynamic action and resting potential. In many cells in the body however, the transmembrane resting potential provides a Back power reserve to ATP. So how does PEMF recharge the voltage of your cells and increase TMP. As you sweep magnetic fields back and forth across the cell membrane at the proper resonant frequencies (0-50 Hz), they generate a whole lot of activity in the cell via induced EMF and resonant energy transfer. (more on resonance in the next module). 1) Through Faraday's Induction, PEMF generates an EMF or electromotive force that helps drive Sodium out and Potassium in Unidirectionally. This conserves the body's Precious ATP. 2) PEMF helps to OPEN the membrane channels via electroporation to allow charges to move more easily. 3) PEMF increases ATP production directly by enhancing mitochondrial functioning and ATP-ase activities. Stored Energy is Coherent Energy that life can will into action when needed. Increasing our TMP while conserving ATP might just be one of the MAIN BENEFITS OF PEMF THERAPY!!! Then MAIN effect is the benefits on the Trans Membrane Potential (or Voltage) and its associated ion pumps, the main ones being Sodium/Potassium and Calcium/Magnesium pumps. The main effect of PEMF is to open these channels favorably and create charge separation which increases VOLTAGE which INCREASES CELLULAR ENERGY!! However, it has been demonstrated that weak alternating electric and magnetic fields can drive unidirectional active transport by this enzyme without ATP being broken down. In other words, the energy from the electric field is directly transduced into transport work by means of the membrane bound enzyme. This means that they can convert fluctuating currents into an electrical potential difference between the two sides from which work can be extracted. This is realizable in solid state devices such as diodes and transistors that act as rectifiers. Rectifiers let current pass in one direction only but not in reverse, thereby converting alternating currents to direct currents. A channel that is "inwardly-rectifying" is one that passes current (positive charge) more easily in the inward direction (into the cell) than in the outward direction (out of the cell). It is thought that this current may play an important role in regulating neuronal activity, by helping to stabilize the resting membrane potential of the cell. Cell Membrane gates and channels can act like a trapdoor that opens in only one direction and requires a threshold energy to open it. Magnetic fields open channels and charge carriers equilibrate across the cell membrane. Magneto or Electroporesis - like opening all the doors and windows in a house and improves this VERY micro micro circulation. Really soak in the image ABOVE... PEMF is literally like opening all the doors and windows in your house to cleanse and air things out. ATP needs to be broken down in ADP to release the stored energy. This process is called ATP hydrolysis and the enzyme that performs the task is ATP-ase. PEMF has been research proven to enhance ATP-ase activity. Important to our consideration of energy medicine is the fact that ATP synthesis by mitochondria is increased by exposure to weak pulsating magnetic fields that are delivered within certain biological windows. Pulsating magnetic fields do this by increasing ATPase activity. PEMF stimulation has been shown to improve mitochondrial function and ATP synthesis in a variety of studies. Oxidative phosphorylation is the process in which ATP is formed as a result of the transfer of electrons from NADH or FADH 2 to O 2 by a series of electron carriers. This process, which takes place in mitochondria, is the major source of ATP in aerobic organisms. Because PEMFs increase microcirculation, it assists in delivering the glucose, co-enzymes, minerals and oxygen needed in the complex process of ATP production. But you can think of it simply as RECHARGING the ATP battery. ====More info to work in. Robert Becker first to show electromagnetic fields are a double edged sword. They can be healing or they can cause problems. If it doesn't affect you, you're. Electromagnetic fields act via activation of voltage gated calcium channels to produce beneficial or adverse effects. Tries various frequencies that have worked in the past. Frequency -- tissue softens when you get the right frequency. WHEN YOU HAVE THE RIGHT FREQUENCY! Profound and palpable tissue softening and warming when you get the right frequency. When you change the frequency, use the wrong frequency or turn it off, it stiffens up again. Turn it off or Change the frequency to something undesirable it stiffens up again. Electrical Stimulation of cells through electro-magnetic induction. The stimulation pattern emulates exercise. 1) Magnetic Flux dB/dt induces EMF in para-membraneous spaces around the cells. (Para- near, alongside, adjacent). By using primary coils in a PEMF device which induces an electric field on the outsides and insides of membranes of cells. Physics of induction is very well understood, it has been around for 150 years and we understand the geometry of cells are. Induced Electric fields.... Moving positive and negative ions around cells. Tissues respond to exercise or mechanical load. This moves the fluid around the tissue past the cells, and when that fluid moves it causes what are called streaming currents which are nothing more than positive and negative ions flowing past the membranes of cells. 2) Induced Eddy currents form in the thin paramembranous fluid spaces, causing net ion flux along membranes. 3) Hypothesis: cells respond to signals from para-membrane ion charge flux receptors not yet discovered. PEMF works by induction like a transformer... The PEMF coils form the primary coil of the transformer. The secondary coil is the para-membranous fluid around every cell in the tissue. When the magnetic field pulses it causes eddy currents that creates an EMF or voltage that drives charged particles into little circuits. Ion in paramembranes space around membranes. 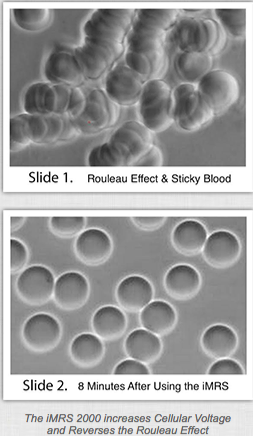 Receptors on the cell membrane detect this movement as normal exercise (fluid moves just like in exercise). This story is based on the work of Linus Pauling and Charles Coryell, who, in 1936, published two articles in PNAS on the magnetic properties of hemoglobin and related substances . Pauling and Coryell confirmed earlier findings that oxygenated as well as carbonmonoxy forms of hemoglobin were diamagnetic but discovered that the deoxygenated protein was magnetic, having four unpaired electrons per Fe atom. This result would have major implications in establishing the role of the protein as an oxygen transporter in the red blood of mammalian systems. Now then let one have hemoglogen deoxygenated (DRBC) and oxygen dissolved/suspended in the flowing blood fluid and apply a srong magnetic field to the blood vessel-----is there an attraction (both are paramagnetic) --then upon combining the hemoglobin (ORBC) goes the other way!!!!! Thus if the material flowing in a fluid is paramagnetic it will drawn toward a magnetic field as well as toward the gravity field. A diamagnetic material will be pushed out of the field and tugged on by gravity. Anti ferromagnetic material will tugged on toward the earth. 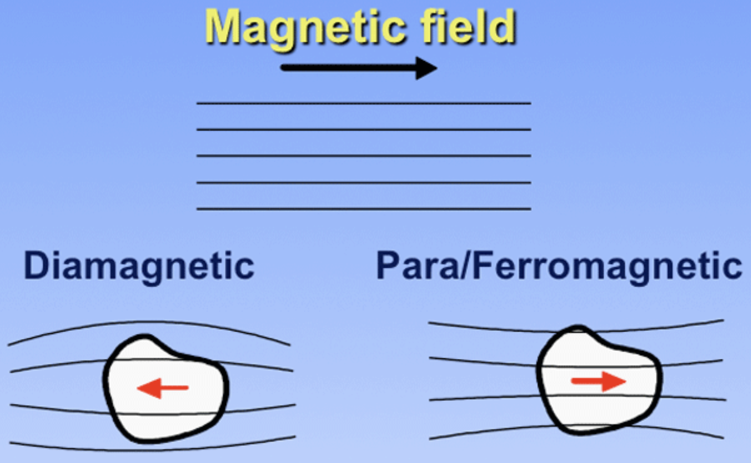 Thus a magnetic field tends to separate paramagnetic and diamagnetic materials in a flowing fluid! Crowding Oxygen and other paramagnetic materials into the magnetic field and pushing water and other diamagnetic materials together. WBC, CO2 This is the REASON WHY MAGNETIC THERAPY TREATMENT WORKS. Oxygen , DRBC, magnetic bacteria are paramagnetic, while CO2 WBC ORBC and water are diamagnetic. Magnetic forces do attract molecules/elements dissolved/suspended in a liquid e.g. 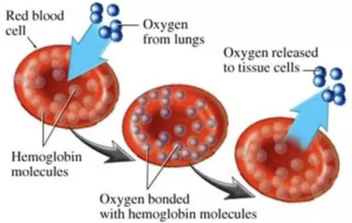 oxygen, some cancer cells, some bacteria, some viruses, deoxidized red blood cells, and other paramagnetic particles and also push around White blood cells, Oxygenated red blood cells, water and CO2 , etc, thus bringing molecules/elements into close proximity and subsequent oxidation or chemical reactions. Magnetism forces react on matter (that has either a positive or negative magnetic susceptibility) similar to gravity but are thousands of times stronger for example Oxygen has a positive magnetic susceptibility in the thousands. Magnetism gently pushes and pulls on these materials flowing and floating/suspended in the liquid!!!!!! Thus enabling chemical reactions. ACTING AS A CATALYST!! Increases reaction rate by pushing into proximity. Keeping with Faraday's Law that A Changing Magnetic Field induces Electrical Currents, let's look at how microcurrents directly heal the body. ​Robert Otto Becker (1923 − 2008), who also documented DC potential changes during wound-healing and regeneration in animals and humans. Notably he showed that potential changes from regenerating and non-regenerating organisms differ markedly from each other (see Figure below). Electric potential changes at the cut end of the stump after amputation in salamander (top), which regenerates its amputated limb, and frog, which does not. "Frequency is a more important parameter than field strength for biological effect." Becker and his colleagues linked the capacity for regeneration to a direct current (DC) electric field, which can be found in all organisms. When a part of the body is cut or amputated, electrical currents are found to issue from the wound (as though from the ends of live wires in a circuit that have been cut). These electrical currents are crucial for the processes of healing and regeneration. One reason most organisms, like human beings, do not normally regenerate amputated parts is because the wound heals over too quickly, so the electrical currents stop flowing before the regenerate influences are complete. Successful regeneration was indeed reported for a child's lost fingertip by keeping the wound open until the regeneration was well on its way. In vertebrates, regenerative healing is found in certain species of amphibians (notably salamanders). It is almost totally lacking in humans, except in the fetus and in very young children (who may regenerate the distal finger tip if the wound is left open). In adults, regeneration is largely limited to parts of the fracture healing process. Clearly, it would be beneficial if humans could regenerate other damaged tissues, both in terms of more cost-effective treatment modalities and improved outcomes for patients. The stimulus which initiates the complex regenerative process in amphibians has been reported to be a specific type of electrical signal, but the mechanism which provides the blueprint for the tissues to be regenerated is largely unknown. Healing in general is known to be related to the degree of the injury, the amount of nerve tissue present at the site, and the electrical potential difference between the site and surrounding intact tissue (the "current of injury"). In particular, regeneration in amphibians such as salamanders and fracture healing in mammals are associated with complex changes in the local DC (direct current) electric field. An injury results in changes in the electric field and stimulates the animal's neural system, which in turn produces an electrical signal at the site of the injury, stimulating the complex cellular responses that eventually produce healing. The electric field gradually returns to normal, pre-injury levels as the injury heals. Conversely, failure of the normal healing process, as in fracture nonunions, is associated with the absence of appropriate electrical signals at the site of the injury. 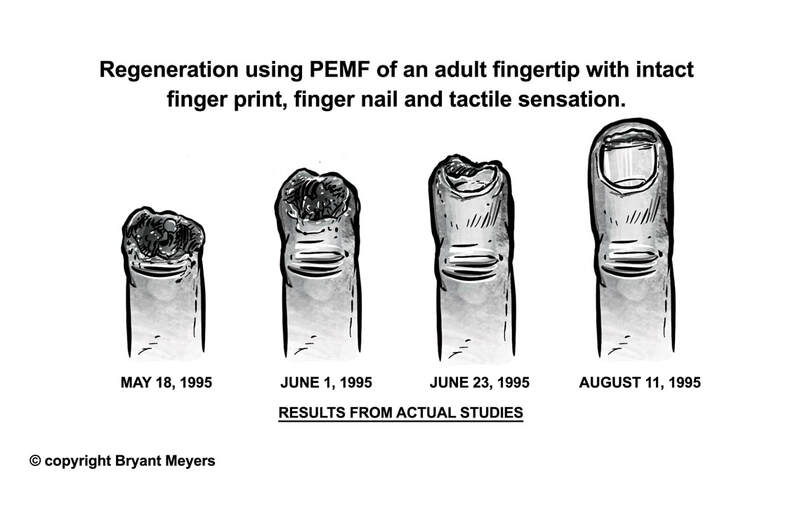 Robert O. Becker: Complete in-vitro regeneration of adult fingertip with intact finger print, finger nail and tactile sensation. Aside - Different sources of EMF (and analogies to the body). light using molecules such as Melanin, Chlorophyll, Hemoglobin, Porphyrine, Billirubin, Cytochromes, Catalases, DNA and more. In a receiver, a bandpass filter allows signals within a selected range of frequencies to be heard or decoded, while preventing signals at unwanted frequencies from getting through. 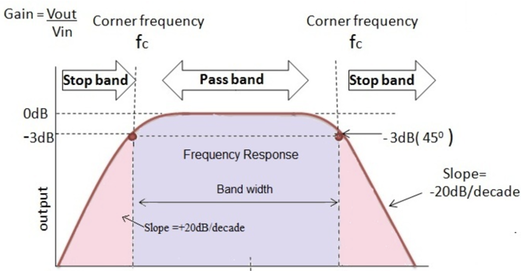 A bandpass filteralso optimizes the signal-to-noise ratio and sensitivity of a receiver.